Keeping Forward Direction Between Scenes. My title scene has the main game logo straight ahead when you start. Player presses a button and the the next scene loads which is the level select/options scene. In the level select/ options scene a virtual screen is straight ahead. So here is the problem. At the title screen is a bunch of audio visualization FX and the player is looking around while the next scene is loading. When the level select/options scene loads wherever they were looking becomes the new straight ahead direction. My game is a seated experience so if they were to return to looking forward in a resting position now the virtual screen is way off center where they were looking when the scene loaded. Now I have a recenter button on the gamepad and touch controls but I cannot expect every player to know to just use that. Is there anyway to ensure the next scene loaded is always oriented at a default direction instead of the initial head direction when the scene loads? Turn off any recenter on scene load stuff you might be using. Thank you delphinius81 that was it. I had an old script from back in the dk1 time of development to automatically recenter the camera on the player prefab. Necessary back in the day but caused problems in the present. I really can't thank you enough for pointing me in the right direction. No problem! I just spent a couple days trying to figure that out myself, only to realize I had a line of code somewhere that no longer belonged. Please tell me where this setting is. I am facing a similar issue. At the Bottom of the OVR Camera is a component called "OVR Manager Script". 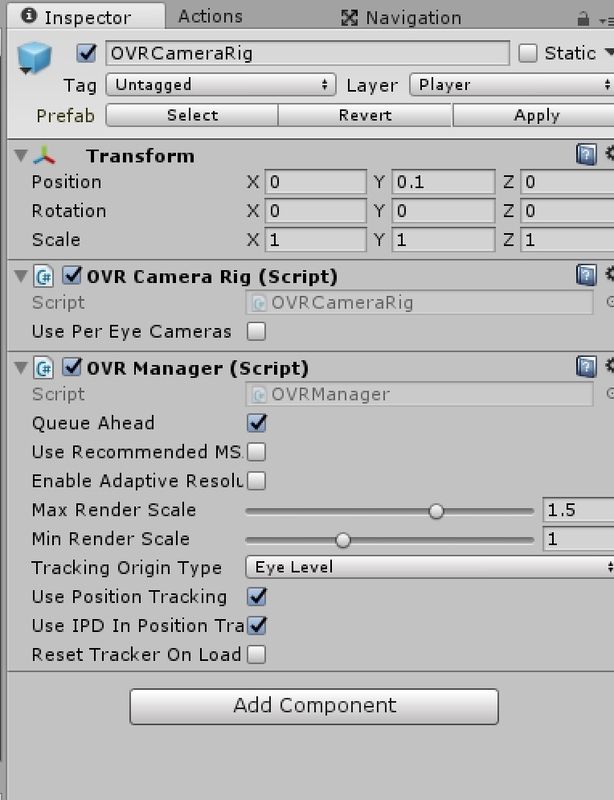 If you are not using the OVR Camera then just wherever you have the "OVR Manager Script" in your Scene. There is a check box for "Reset Tracker On Load". Leave it unchecked. Make sure you don't have any other script you made that call a recenter camera when your scene loads as well.